CBS has a feature on the status of flying cars. 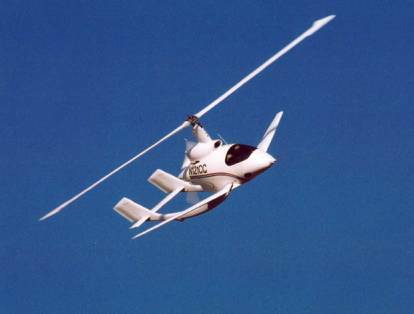 I only knew about the Moller Skycar, which they mistakenly thought is a new entry. He's probably the veteran in that arena. But there are several other promising projects, apparently. Like the Air Scooter, which is vertical take-off ultralight thing. Not exactly as comfy as the Skycar, but it might happen sooner. And the CarterCopter, which is a little plane/helicopter combination, which already flies. And there's Skyblazer, but that doesn't seem to be much more than a concept. Alright, the Moller Skycar still seems to be what looks most like a flying car that actually, sort of, can fly at this point. And what we really need is anti-gravity. That would make it much easier. I think what's really missing is that anti-grav module to get rid of all these ridiculous wings, rotors, etc. Unfortunately I misplaced my plans for the one, and I also forgot where I parked my space ship - darn! 19 Apr 2005 @ 00:03 by Joel @68.4.187.230 : No way! If motorists start taking to the air, I'm going to stay on the ground. Yeah, you don't want the guy next to you chatting on his cell phone while flying that thing. I don't think it is going to be practical without computer controlled flight. And it better not be Windows. ancient Indian Vipanas ("Flying -- or SPACE-- Cars" from Harappa , if I remember correct???) Not too long ago I saw some Info that someone actually was building one, following the old Instructions still around. 19 Apr 2005 @ 16:07 by astrid : LOOOOove your Q,Jazzo! Yeah, these things are gas guzzlers, I'm sure. So, that doesn't really brings us forward in any very useful way. We need some kind of sustainable anti-gravity. Burning dead dinosaurs in combustion engines is so last millennium. last month for a conference, and I tagged along. It was the first time we'd been in a plane in 22 years. I figured it'd be our last...but I must say the thrill of takeoff and flying 7 miles high was absolute heaven. First Class too! ...i'll do some research in the field of Vipana fuel. And I'll get back to you with some Good News -or not! thats so crazy flying cars! what is this world comming too. theres going to be maniacs flying those things. The flying car is not only a vehicle but also an aircraft. The car can actually be used for traveling on a daily basis but for now it is not advisable to be driven on roads.